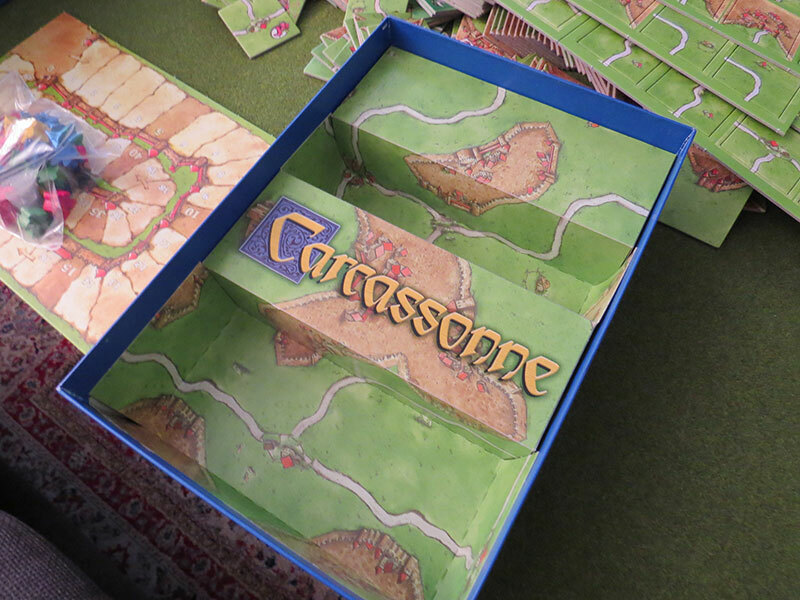 I've noticed that some of my base game sets, the Scandinavians to be exact, has a coloured inlay fold. Thought I check with you guys if your version(s) also has these. As for my English sets, they are grayed. Is there the new Cover design from the Version 2013? Then the inlay is coloured. Finnish insides are orange/sepia colored.. Except the new Hills and Sheep expansion... It's colored like yours on the picture there. Yes, that's ours as well, expansions are orange-white. Is there a Finnish release or only English in Finland? Oh, and right now, it's kinda rare to get your hands on the Tower and the Catapult Finnish versions.. They have been sold out for many years, and Finnish collectors really want them in Finnish, not English..
As for the Tower, it still exist here but only one store still sell them for 9 Euro each. I bought six of them and now there's 7 left. Not really sure why I am pursuing these. 10 000 tiles will require a lot of Towers! I'm in desperate need of a new storage for my tiles. Anyone going to Sweden soon? Seems prices are super cheap there! Sweden is a pretty expensive country.. We were in Stockholm this summer and everything was expensive... You even had to pay for public toilets.. Very pretty country, but Stockholm was expensive..
Sweden overall is expensive. Normally. Stockholm is a bit poshed up these days. I grew up there but moved to Gothenburg at the age of ten. Gothenburg at least has free public restrooms and most of the pubs and restaurant has an agreement with the city to offer free service as well. Craziest part probably is this: Postage is cheaper from Germany to Sweden than shipping from Sweden to Sweden. Did you look at the cover or did you look at the rules? If it was produced in 2013 - than you have the coloured inlay. Yep! Read it. It's a nice upgrade. Feels more cheerful. Even the tiles are much better. Darker grass, sharpened edges. Speaking of the grass, I have noticed that my River1 has normal light green grass (like all other tiles has) but my River2 that came with the base game has darker green grass.. I don't mind that though, because that way I see the difference between those two, even though I store them together.